Parafilm M® is a moisture-resistant thermoplastic used in research, clinical and industrial laboratories. This laboratory film can be utilized to prevent contamination, evaporation or spills. Parafilm M® is self-sealing, flexible, odorless, semi-transparent and can stretch and mold to irregular shaped surfaces providing a reliable barrier. Available in an array of sizes, Parafilm M® can be useful in electron microscopy droplet staining and thin-film grid coating. It can also provide a non-slip surface on trays and shelves for instruments or containers. No. 807-6 For smaller applications, 2" squares can be cut quickly with the dispenser and used for test tubes, flasks, and covering irregular surfaces. In horticultural research, Parafilm M is used to seal grafts and cut stems to prevent moisture loss. No. 807 Saves time when medium sized sheet or strips are needed for larger beakers, tubes, trays, containers and culture media. No. 807-4 Horticulture research as a membrane for insect feeding, tray and shelf liner for bottles and instruments and other laboratory EM and microscopy applications. This ABS plastic dispenser is designed to store, dispense and cut Parafilm®. The Parafilm® Dispenser has a unique design for the cutting mechanism providing maximum safety. The safety razor slides along a special edging with no danger to fingers. Each dispenser comes with 2 replaceable blades. 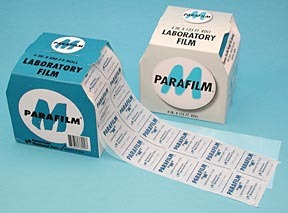 The Parafilm® Dispenser can hold up to two 2" rolls (50mm) or one 4" (102mm) roll. Sheets of Melinex film, 175µm thick, make a very convenient substrate for growing cell cultures and for later incorporation into blocks. Sheet size: 210 x 297mm. 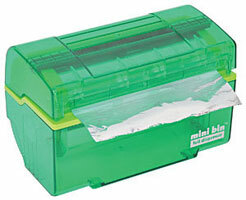 The Mini Bin™ is the perfect alternative to the large, cumbersome aluminum foil rolls and expensive precut foil squares. This compact unit is an ideal fit for any laboratory bench or workstation. The Mini Bin™ Aluminum Foil Dispenser can accommodate either the 4-inch (102mm) or the 6-inch (153mm) aluminum foil rolls (sold separately). The unique design is easy to load and safe to use by recessing the blade in the lid. Pressing the cover activates the safety blade to cut the foil. The non-slip feet offer stability and an internal foam strip keeps the foil from retracting into the unit. 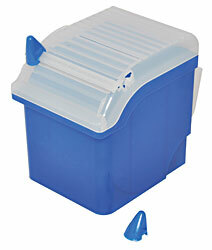 The Mini Bin™ versatility makes it a necessity for any laboratory, research environment or manufacturing facility.